Some brides want to glam it up on their special day, while someone like me really wants something fun and comfortable to wear beyond the wedding. I'm talking about shoes here, and chosing the right ones can be as painstaking a process as finding the dress itself. (When in doubt choose red, I say). For those brides (like me) who prefer comfort on their wedding day, there are flipflops or runners for you. For those who prefer to go more glam but want to stay away from shoes in white, there are fantastic shoes in a variety of colours. I love the splash of colour peeking out from under the white dresses. 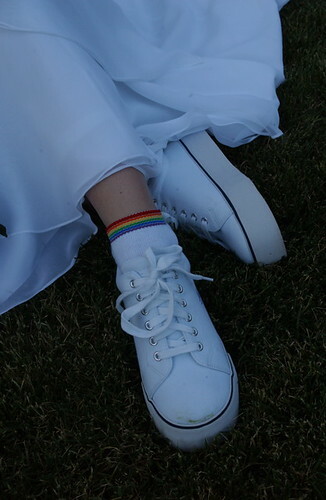 Get a load of these appropriately titled "Wowza" wedding shoes. They're really fun and glamorous. For something really unique there are even hand painted shoes.